I’d like to say I was only a little excited to finally see this unveiling but I have been thinking about this for a year! The Foil has been such a bench-mark in Aero frame design and quite frankly, so good, they haven’t had to change it in 4 years. But, when it takes 2 years in development, you know it’s going to be good. Here is the official review from Cyclingnews.com…it’s pretty comprehensive. Hangars 7 and 8 at Salzburg’s airport house a quite remarkable collection of machinery. From a huge Douglas DC6 to many Grand Prix winning Formula 1 cars, via several Alpha Jets, a Cobra helicopter gunship, and highly polished, extraordinarily beautiful P25 Lightning WWII fighter. 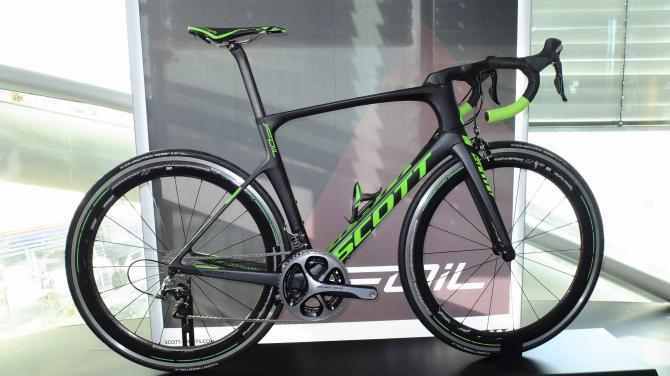 All have one thing in common – aside from being part of the collection of Red Bull owner Dietrich Mateschitz – that being their pursuit of speed through the air, something Scott’s road bikes have become known for. Scott’s original Foil aero road machine was one of the first of its genre, and has achieved great success, winning (at the time of writing) 115 World Tour races, 16 Grand Tour stages, and 3 Classics. The new Foil, launched today, comes with the slogan, ‘Win Every Ride’, which is quite a target. Present at the launch was IAM Cycling’s Australian road champion Heinrich Hausler, who has raced for three years on the original Foil, and only today received his new one. He explained that he finds it ideal for one-day races and sprints, being really stiff and efficient. Some riders in the team switch from the Foil to the Addict, he said, but he sticks with the Foil, apart from at Paris-Roubaix when the Addict’s more supple ride makes it the better choice. Scott Sports are a company with US roots, European engineering, Asian production, Swiss organisation, and joint Korean and Swiss financing, and their new company philosophy is ‘No Shortcuts’. Explaining how this approach shaped the new Foil, Chief Engineer Paul Remy said the project has taken two and a half years to reach fruition, and began with the combined aims of improving the Foil’s aerodynamics, weight, power transfer and comfort. The resulting new HMX carbon fiber Foil frame in M/54cm and fully painted, including all hardware is claimed to weigh 945g, with the fork a further 335g, for a 1280g complete frameset. Weight aside, far more impressive is the claimed 89% increase in vertical compliance, and lateral stiffness increases of 13%, 13.5% and 6% at the bottom bracket, head tube and fork respectively, all when compared to the original Foil model. There is also an HMF carbon model of the new Foil, which is less stiff, and 80g heavier. Stage 1 – finding the final tube shaping. This was defined by the aerodynamic effect and comfort achievable, arriving at a Kammtail-like truncated teardrop profile. Stage 2 – 3D modelling of the frame shape. Add wheels for accuracy, then interpret results from Computational Fluid Dynamics (CFD) software. The CFD stage took around 5-6 months to complete, with each design iteration taking around 2.5 days for the computer to process. Stage 3 – rapid prototyping, then wind tunnel tests with a mannequin. Interpret data and refine the design as necessary. Drag reduction was a major aim, and Scott’s calculations showed the drag distribution for each part of the bike, shown as a percentage of the total frameset drag was: frame 65-80%, rear wheel 5-10% and front of the bike 20-30%. With the front end responsible for 32-54% of the total drag, Scott reasoned it made sense to optimise it aerodynamically. A dropped down tube and recessed fork crown close the gap behind the fork, and the headset’s lower bearing is also dropped to allow the head tube to be stretched and smoothed for cleaner airflow. A new one-piece aerodynamic cockpit is also available for maximum benefit, but more of that later. The seat tube creates 15-33% of the total drag, depending on yaw angle, so lowering the seat stays and partially closing the gap between the rear wheel and seat tube reduces the vortices that can be present here. 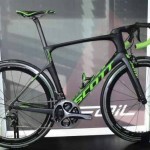 Scott tested in a wind tunnel with a mannequin aboard the new bike, and their figures show drag savings of 6 watts at 45kph, that equate to 27 seconds over 40km. The frame features integrated moulding, superlight dropouts and continuous fiber orientation, using ultra high modulus (UHM) Toray M55j and M60J carbon fiber in critical areas for ultimate stiffness. Too rigid to use universally in the frame’s construction, it’s only used in areas of maximum stress, and carefully orientated for stiffness on the sides of the down tube, seat tube and chain stays. The heart of the frame is a press fit 86 bottom bracket, offering a chunky junction for the rectangular chain stays and sizeable down tube to optimise power transfer. The head tube has a generous connection to both the down and top tubes, the latter being as wide as UCI regulations allow, and it houses a 1 ¼” fork steerer turning in a 1 ¼” – 1 ½” headset. An ever more common feature, slim, dropped seat stays that aren’t braced by a brake calliper allow increased vertical frame deflection, amplified by the seat tube’s reduced cross section, and resulting in greater flex and rider comfort. Scott say that compared to the original Foil, the new frameset is 89% more compliant, making it almost equaling figures for the Addict. The fork is also 11% more compliant, and a small amount less than that of the Addict. The frame is fully compatible with mechanical or electronic shifting, with an integrated seatpost battery holder. All cables except the front brake are routed through a large port on the top of the down tube, which is more aerodynamic and, by only creating one hole that avoids drilling through the stiffest carbon fiber in the tube’s sides, doesn’t compromise stiffness. There’s an integrated chain catcher, Shimano direct mount brakes front and rear, and the new Foil is designed for 25mm tyres, but will accept 28mm rubber. Since riders liked the old bike’s stack and reach, the new model maintains the same geometry. The proprietary seatpost is very square in profile, measuring 32mm deep and 25mm wide, with 5mm or 20 mm offset options, and there’s an integrated seat clamp bolt within the top tube in front of the post. A major element in the Foil’s drag reduction is the new Syncros RR1.0 one-piece carbon fiber bar and stem that will grace the two top models in the range. A 42cm bar/110mm stem combo weighs 395g, and features full mechanical and electronic cable integration, including the Di2 controller, and two specific Garmin mount options. In time there will also be a clip-on aero TT bar option available for it. The integrated steerer clamp is designed in a way that makes it impossible to over-tighten, and should you wish to buy the RR1.0 one-piece as an aftermarket item, there is a reducer shim for 1 1/8” steerer tubes. If one-piece is one piece too few, Scott will also offer a separate integrated Foil-specific Syncros Aero RR1.5 stem that will accept regular handlebars, and it will come in seven lengths from 80mm to 140mm, all at -6 degrees for now, although there’s a -17 degree version that’s available to pros only at the moment. There will also be a Foil HMX (Premium) and HMF frame only option. Availability for the HMF carbon models will be from October, and December for the HMX versions. All pricing is still to be announced.